Single song released through digital download. Currently available through iTunes and other online digital retailers. Dave Goodrich's ode to love. Besides providing the lead vocals as well as all instrumental tracks, Dave Goodrich produced and engineered this soulful tune. Mastered by Abbey Road Online Mastering. 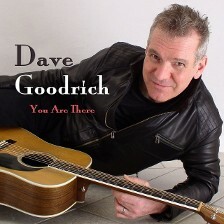 Tuesday, February 10th, 2015 marked the digital release of singer/songwriter Dave Goodrich’s single You Are There, a love song all wrapped up in soul and ready to roll into hearts everywhere, just in time for Valentine's Day. “I just wanted to write a sweet, soul love song for my wife for Valentine’s Day. Something that might last for many Valentine's Days to come,” confesses the song's composer. Watch the official video on Youtube!